If Scrooge’s ghost of Christmas future came to me last January and told me all the things I would be doing in 2017, I wouldn’t have believed it. Looking back now having done it all, I still kind of don’t believe it. Did I do some really cool, exciting stuff? Yes! Actually, as I finished sorting the last of my photos from 2017 (which I put into albums for each new place), I looked at my list and realized I had over 30 albums! However, as I reflect on the year, I realize that it isn’t the big goals or new places I visited that come to mind, it’s the “small” things. Every day I do my best to move toward stepping into my higher self, yet when people ask how I am doing or what I have been up to, I rarely share those everyday things. Granted, on the surface, they may seem small or insignificant, but the joy and growth I experienced in each of these moments were huge. So, I thought it would be fun to document all in one place what is possible in a year—both big and small. I trust that in the process of creating this post it will not only motivate and inspire me to dream big moving forward in 2018, but it may do the same for you. I started writing my novel, and completed 27,000 words in the month of November! I took a major leap and empowered myself by spending five days dry camping alone in our RV! I went 100% vegan (after watching “What The Health” on Netflix). I let go of loads of stuff I was still holding onto in storage at my mom’s house. I wore a hole in a pair of Converse thanks to walking over 300 miles on my summer trip around Europe. 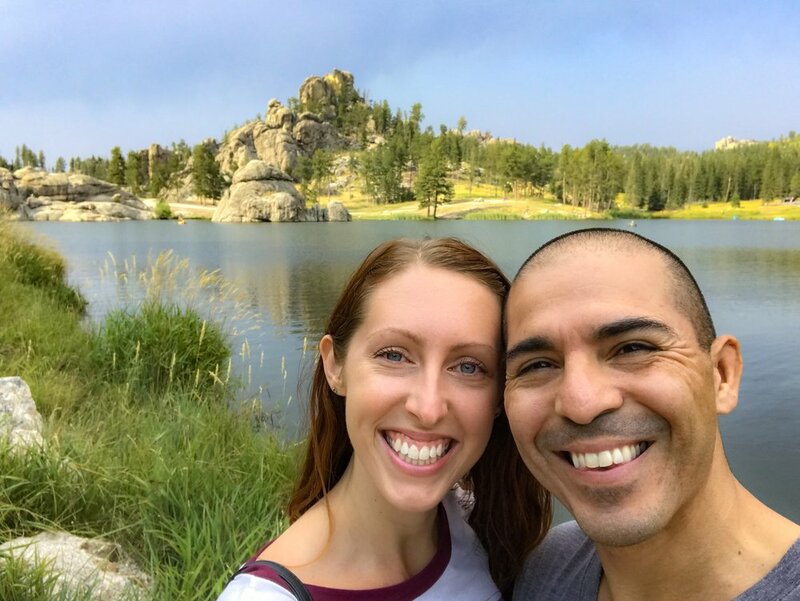 I grew my partnership with my body and had the best hike of my life in Custer State Park in South Dakota—I felt the strongest and nimblest I ever have hiking. It was my busiest year of travel ever! I started 2017 off pretty simply, spending time with family in Phoenix and working. Al and I did attend a UFC Fight, which was quite exciting as it was the first live UFC match I had ever been to. Arizona is just a fantastic place to spend the winter months, as the weather is spectacular—no freezing temperatures, no snow, and plenty of sunshine in Phoenix! I love still being able to workout outside and go hiking. We also had plenty of meals at our new favorite restaurant in all of Phoenix, Veggie Village! It is an adorable little family-owned restaurant that is 100% vegetarian Asian-inspired food. They can even make all of their dishes vegan. The only place that I’ve had vegetarian Asian food this good is actually in Asia. I’m hooked on their mutton curry!!! February was spent hunkering down in Phoenix and preparing to hit the road. We got the RV in September 2016 and were only on the road with it for about a month before settling down with it in Phoenix for the winter. So, there was a bit of a learning curve making sure we had everything mapped, stocked, and planned for our cross-country RV road trip from Arizona to Ohio. I even spent weeks cleaning out and selling the last of my things I had left in storage when I moved to Los Angeles in 2014, which really set in stone my downsizing and moving fully into the RV. Fun was had too though—we attended our first RV show, went on a weekend road trip without the RV to visit friends in Los Angeles, I held a snake for the first time, and we began booking and planning an epic 2-month summer trip to Europe. I had a massive garage sale, then we hit the road with the RV one week into March. Our very first day on the road, we stopped at our first random roadside attraction—The Thing! Our first week on the road, we overnighted at rest areas four nights in a row before arriving in Junction, Texas. (That means for four days we did everything including cooking, eating, working out, and sleeping at rest areas right along the highway for free!) We enjoyed many more pit stops at random roadside attractions from natural springs to underground caverns. I didn’t know what to expect arriving in Junction—a small town of about 2,400 people—to stay for a month right on the Llano River. It ended up being an amazing experience! It was such a peaceful place that I found the time and space to finish creating, writing posts, and launch my blog here. I spent my days biking into town to the county library, writing, working out, and going on walks along the river—a perfect introduction to full-time RV life! We finished out our month in Junction by exploring more of the surrounding area and discovering the beautiful Texas hill country. An entire day was spent in Fredericksburg taking in the Texas wildflowers, Das Peach Haus’ lake and yummy samples, and walking the small town’s main street. In the middle of the month, we moved on, although not very far, to Spring Branch, Texas. It is an even smaller town of only around 250 people! Our RV park was a quaint family-owned operation that only takes long-term RVers staying a month or longer, so it felt much more settled. Spring Branch may be small but it is a great jumping off point to fun activities in the nearby area. Just an hour’s drive away was Austin, Texas, which made for a great day trip to try out all the vegan eats Austin has to offer (more about that here). There aren’t a lot of cities that I would actually consider moving to, but Austin is one of them. 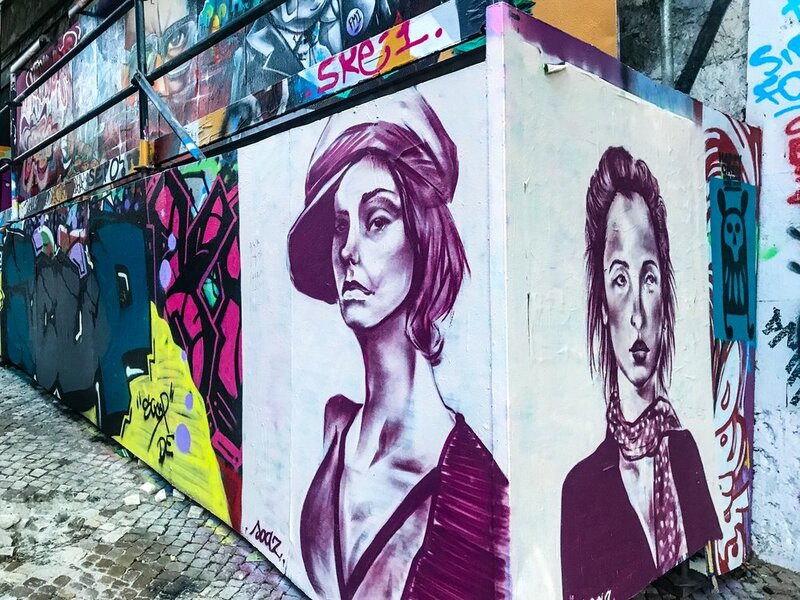 It has a fantastic balance of nature and city, great vegan and healthy eating options, tons of music and art, and generally has a really cool vibe and great people. Back in Spring Branch, we enjoyed more walks along the river, now the Guadalupe River, and started making our own homemade bread. From our base in Spring Branch, we took a few half-day trips to San Antonio to soak up another of Texas’ wonderful cities. 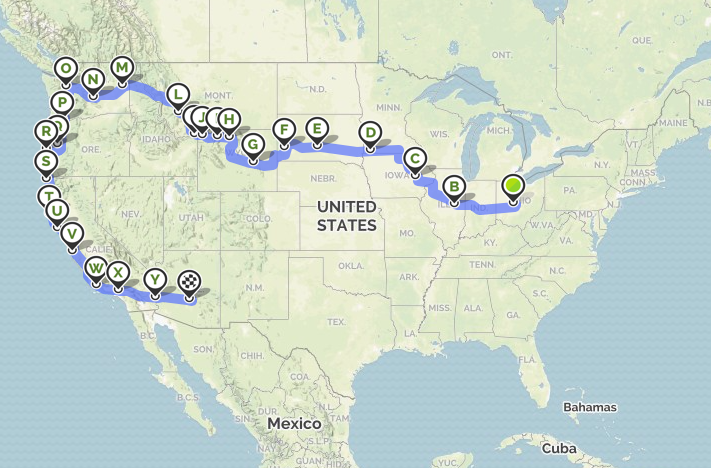 All while planning and preparing for the next big chunk of our cross-country road trip one week into May. This time with only two overnights at rest areas in Texas and Arkansas before our next stop: Nashville! Food being priority number one no matter where we travel, it was mostly a tour of all the best vegan restaurants. And yes, you can get *vegan* Nashville hot chicken… at the same place where I had vegan chicken and waffles for the first time ever. It’s a real treat! Our adventures continued on to my old stomping grounds where we stayed at our first state park, John Bryan State Park in Yellow Springs, Ohio. I got to visit with family, introduce Al to the US Air Force Museum, and check Jungle Jim’s Grocery Store off my Ohio bucket list. Bonus: we made friends with some really cool people at the state park who JUST picked up their RV the day we met them. Eight months into our full-time RV journey, we shared a dinner and loads of RVing advice. Next, we finally took a break from the road in Powell, Ohio as I researched and prepared an itinerary to play tour guide for my partner’s family on the first two weeks of our Europe trip. June was an amazing month of international travel! It was well-timed because we had to leave the RV with a dealer to get warranty work done; what better time to travel than while our home is out of commission, eh? 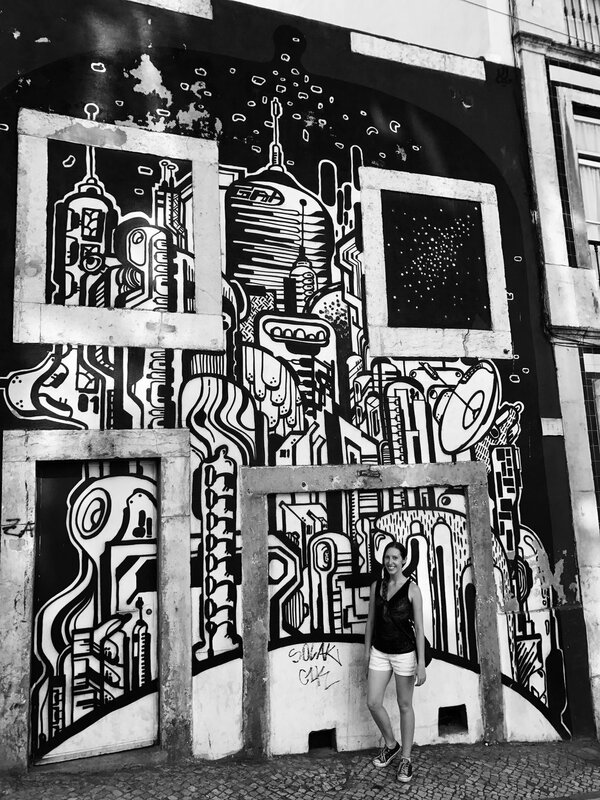 Al’s parents joined us for a two-week trip starting in Barcelona where we enjoyed empanadas, sangria, touring the magnificent Sagrada Família, exploring the Gothic Quarter, eating everything at the Boqueria market, and drinking with Hemingway… Well, sort of. We went to the oldest bar in Barcelona, Bar Marsella, where everyone from Hemingway to Picasso used to frequent. In the South of France we spent four days taking in the sights—and the wine, haha—of la cité at Carcassonne, the beautiful vineyards surrounding the small village of Azille, reconnecting with the family that Al and I had for Workaway hosts, indulging ourselves at Les Grands Buffets in Narbonne, dipping our toes in the Mediterranean, and finally getting to see the pink salt flats in Gruissan. This was followed by my third visit to Paris (my lifelong dream, so I’m always happy to go back again). I was thrilled to get to share my love and expertise of Paris with my partner’s family, so I took them all over the city! We made it to Montmartre, Notre Dame, Shakespeare and Company, the Eiffel Tower, the Arc de Triomphe, the Louvre, and took a cruise on the Seine. We would have stayed on for the rest of our trip in Europe, but it was split up by a friend’s wedding in Ohio we had to return mid-trip for. Upon our return to Europe, we spent three days in Zürich and had the sweetest Airbnb hosts ever, ate raclette, walked around the old town, climbed Grossmünster tower, enjoyed some Swiss chocolate, and almost got caught in a rainstorm walking around Lake Zürich. I don’t think words can even capture how much I experienced in July. Milan had great history and architecture, and I particularly enjoyed the eight euro all-you-can-eat aperitivo deals as well as the canal district. 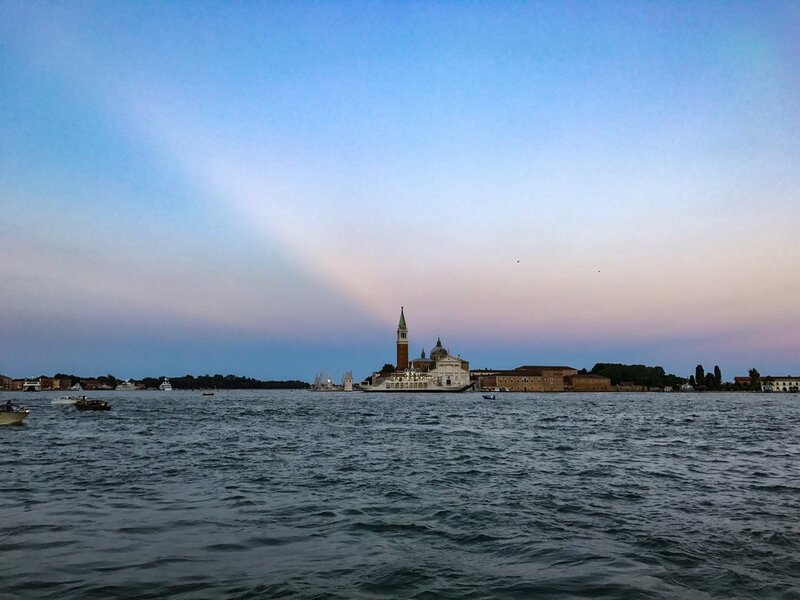 Venice is simply breathtaking and truly a once-in-a-lifetime, must-see experience! It struck me on a deep level much like Paris with how unique it is, although I was saddened to discover that the culture and the native Venetians are fading away (due to issues caused by lack of modern regulations and catering to the tourism industry). Budapest felt like home to me. Despite all my travels, there are very few places that I could see myself living, but Budapest made the list. The culture is beautiful, the people are lovely, it is very affordable, there’s actually loads of vegan food, and the city is known for its thermal baths. I did thorough research to pick the best one to go to and we ended up making it to the oldest bathhouse in town that was built in 1565. We decided to try something different and use BlaBlaCar to get from Budapest to Vienna. It is a ridesharing service where you book a seat in somebody else’s car, then meet them somewhere to hitch a ride with them. It was an absolute blast! We shared a car with a girl from Austria, a couple from Russia, a girl from Hungary, and the driver was from Hungary. The wildest part was crossing the border and our passports were locked in the luggage hold on the roof of the car, so the Austrian border patrol let us cross after only seeing our US driver’s licenses! Vienna was all about sharing because it was also the one place where we Couchsurfed on this trip. We stayed with a really friendly Austrian family with a teenage son, and we honestly felt like we became part of the family that weekend. Next…nine days in Prague flew by, and I already couldn’t wait to come back. We ate almost every meal at the Loving Hut vegan restaurant, walked all over the city, I reconnected with an old friend from high school, and we had a blast hanging out on Náplavka with the locals. This was followed by a week in Lisbon, which was plenty because the amount of walking that we do to explore paired with the hills of the city actually make for an exhausting combination. We became regulars at a local Indian restaurant right around the corner from our Airbnb, and the owner even hooked us up with the ‘locals’ price instead of the tourist price. 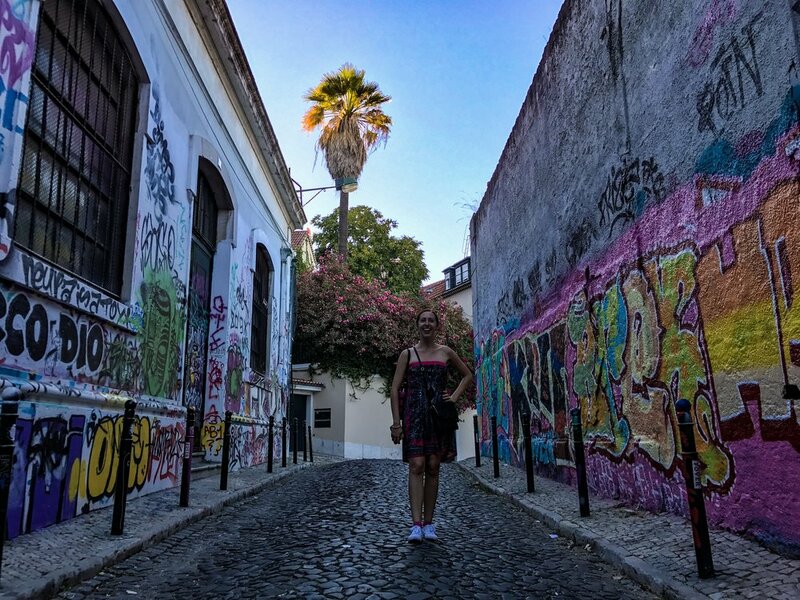 Our time in Lisbon was spent soaking up the sun, art, culture, and climbing to the top of many hills to check out the view. While hanging out in a public square listening to music, we made friends with a great group of guys from Mozambique who we have stayed connected with (and actually bumped into them a few times around town! #SmallWorld). Our first day in London was perfect—cool, a bit of sun, and just right for doing some exploring. London was a big bucket list spot for me, so I checked off Notting Hill, Platform 9 3/4, Hyde Park, Buckingham Palace, Big Ben, Tower Bridge, Westminster Abbey, a red phone booth, Trafalgar Square, the original Twinings tea shop, the Temple Church, and walking for hours in the London rain… Oh, wait that last one wasn’t on my bucket list! Ending our trip in Dublin was quite perfect, although quite cold for our standards. We went to the oldest pub in town, visited St. Audoen’s Church, walked about Dublin Castle, learned about Vikings in the national gallery, went to almost all the free museums, and happened to get free tickets to tour the Guinness Factory and seven ticket stubs for free pints of Guinness. I have never been a beer drinker, but goodness Guinness is good when you get it right from the source! Upon returning from our trip, it was quite an experience picking up our RV from the dealer who had been completing warranty repairs. (I won’t go into the details, but I will say the RV industry is very dysfunctional.) After moving back into our home on wheels, we hit the road from Ohio excited for our first destination: Keystone, South Dakota. I didn’t really have any expectations for South Dakota, but I was pleasantly surprised by how amazingly beautiful it is. I’ve been to 36 of the 50 states and it is the MOST beautiful one so far (although I’ve been told that Alaska beats all!). September was an epic road trip month with loads of new experiences! We could have driven straight from Ohio to Arizona, but we would have 1) arrived in Arizona while it’s still way too hot and 2) missed out on all the fun. So, we mapped out a route through the northern part of the US and all the great stops along the way. We visited Mount Rushmore and Custer State Park in South Dakota, where we actually saw a huge amount of wildlife—my first buffalo sighting, prairie dogs, and tons of other neat creatures. We split up our drive to Yellowstone National Park with a stop in Glenrock, Wyoming. It’s a small town with a cute little recreational park that allows free camping. On the road again, our next overnight was in Cody, Wyoming and it was our first night staying for free in a Walmart parking lot (actually quite fun)! Yellowstone was purely magical and two days there was not enough time. I share our 2-day itinerary to see the best of Yellowstone here. We did a lot in our time there, but there’s just so much natural beauty to take in. Upon leaving Yellowstone we had a bit of a scary road trip through Montana, as our truck almost overheated climbing a mountain that wasn’t even as steep as many other mountains we had driven. But, we made it and continued our trip to Spokane. Every last bit of Washington was really cool! The people are super nice, the scenery and nature are amazing, and each city is unique. Spokane felt very historic yet hip and had some delicious vegan food for us to enjoy, as well as Roast House Coffee (our new fave!). We don’t always book RV accommodations way in advance to allow time in case it takes us longer to drive somewhere, so we had to delay our trip to Seattle by a few days because no RV parks had availability. Some quick research online and I discovered Vantage, Washington, a lovely town right in the middle of the state with a petrified forest, the Columbia River, and a population of 40. Our RV park with Passport America discount was just $15 per night! Next, Seattle was spectacular because neither of us had been there before and it’s a truly special city. We got to connect with our friend Dave which made it even better of an experience. From Seattle, we began our journey south and stayed with the lovely couple who hosted us on Workaway at their retreat center in Hawaii. It was perfect timing to be in Battle Ground, Washington with them, while also being close enough to the Oregon border to explore Portland. We stayed on in Tualatin, Oregon just south of Portland to get to know more of the area before leaving town. We really didn’t experience much of Eugene, Oregon outside our RV park. It was really more of a 4-day pitstop for us to reset and get ready for another long haul. The day we woke up to begin the drive south into California, we had our very first flat tire on the RV! Luckily, we have a compressor to inflate the tire and there was an auto shop that works on semis and logging trucks just a mile down the road who could handle an RV without a problem. We were back on the road in no time flat—pun intended—and we took to the Oregon coast to drive the scenic route. Wow, I must say the Oregon coast is magnificent! I was constantly taking photos out the window until Al asked me to stop rolling the window down and letting all the cold air in. 😂 Once we crossed the border into California, it was only a short distance to the spot we reserved right in the heart of the Jedediah Smith Redwoods State Park. It was an awe-inspiring experience to spend a few days hiking amongst the gentle giants. It was so peaceful, and another place I really look forward to returning to. Moving further south we discovered that the Glass Beach in Fort Bragg, California was right along our route and we conveniently timed it to be our lunch spot. Check that off the bucket list! We reached a point in our road trip that took us even closer to the coast, driving down the California-1 Highway. I would not recommend taking this route with an RV! It was the longest and most stressful driving day we have ever experienced, as it took us 9 hours to drive less than 300 miles. We were rewarded with a spectacular cliffside campground with amazing ocean views, no hookups, and no cell signal. I took a big leap in October and stayed at our next campground for five days dry camping alone in the RV! (Dry camping means there was no electric, water, or dumping hookups at the park.) This doesn’t sound like a big deal, but it was for me because I had to learn how to manage our RV battery, run a generator, and live with no hookups without my partner to rely on. I was really nervous making the decision, but by the end of the week I felt so empowered by what I learned and how well I handled it all. It was another beautiful campground too, nestled behind a massive sand dune on a state beach. Once Al returned from his business trip, we moved on to a quick overnight near Los Angeles, California and crossed the border into Arizona. We officially dry camped on our first BLM land (basically public land with free access to anyone for recreational use and camping) in Ehrenberg, Arizona. There was nothing around for miles and the desert sunset was beautiful! November was a month of stillness. We traveled so much all year that it is really nice to balance it out by settling down in one spot for a few months. So, I dedicated the month to work on the things I didn’t get to during our travels. I redefined success for myself by participating in National Novel Writing Month (NaNoWriMo for short). It brings together over 400,000 people around the world to commit to writing 50,000 words of a novel in November. I wasn’t sure it would fit in my schedule, but I put everything aside and went for it! I didn’t make 50,000 but I have 27,000 more words for my novel than I did at the beginning of the month. Instead of being upset that I didn’t make their goal, I am grateful that it brought out my confidence to write the book that has just been waiting in my head all this time. We got to enjoy some classic winter weather and even see a spot of snow on a trip to Salt Lake to visit friends. We had planned on coming to Arizona via Salt Lake with the RV on our end of summer road trip, but the mountainous drive looked like it would be too much for our truck to handle. A flight to Salt Lake from Phoenix is super short and we used points with Southwest to book, so it was way easier than RVing or even road tripping to visit them. We had a blast just spending quality time with our friends. December is also a fantastic month to spend time with friends and family. I got to see my family that lives in Arizona, as well as my grandparents who came to visit from Ohio for the holidays. 2017 was such a spectacular year and a very busy one! I would tell you what I have planned in 2018, but I honestly don’t know yet (just as I didn’t know about all the travels to come in 2017 at this time last year). However, I am looking forward to all the unexpected excitement that 2018 has in store.